Articolul în română – Curiozități din Viena, îl găsiți AICI. I was in Vienna for the first time 5 years ago in September 2013, when intentionally took a 9-hour stopover to see the capital of Austria. The final destination was Warsaw. Then, from morning till evening, I have visited almost all the important tourist attractions, but I could not feel the atmosphere of the city, enjoy it … Now, in April 2018, the time has come and I have recovered everything – crossed the center of dozens, visited Belvedere, I have discovered the impressive Schonbrunn Zoological Garden. So, in conclusion, it was a nice, relaxing city break. Vienna can be described by sobriety, elegance, luxury, history, tradition, art. The architecture of the city is impressive. The buildings, palaces are very large, with enormous gardens, with sophisticated decor. All the buildings are kept, it is not destroyed, it is not demolished, and many of it can be seen in reconstruction – to avoid their „loss”. Unlike last time, this time I saw many buildings under construction, some blocked roads. Taxi drivers say that the number of new buildings has increased in recent years and that the city is changing, but the old style and architecture that Vienna has used to its visitors. Yes, the center is full of tourists. This is one thing you can not miss in a big city, especially if it’s a popular destination, but if you do not love the crowd – you can walk away from the center, a few hundred meters, and breathe easier, or you can choose a restaurant in a „hidden” yard or a less interesting place for visitors all over the world. Vienna is about palaces, many palaces, and big parks. „Great” – I think it is the word that describes buildings that have become historical, cultural, and tourist objectives in Vienna. In Vienna, often rains. When I was in 2013, in the autumn, every 5 minutes was raining, and every 5 the sun was out and the wind was constantly blowing. Most of those who have been to Vienna several times say they have caught cloudy, rainy weather, but I have had very generous sunny days. It was warm, over 20 degrees, but on some days there was also relatively strong wind, sometimes clouds, but no rain. All Vienna is about Wolfgang Amadeus Mozart – Austrian composer, and Gustave Klimt – Austrian painter – both known worldwide for achievements in art. From „Mozart” or „Klimt” chocolates – to mugs, shirts, cafes – you meet very often on the streets of the city. 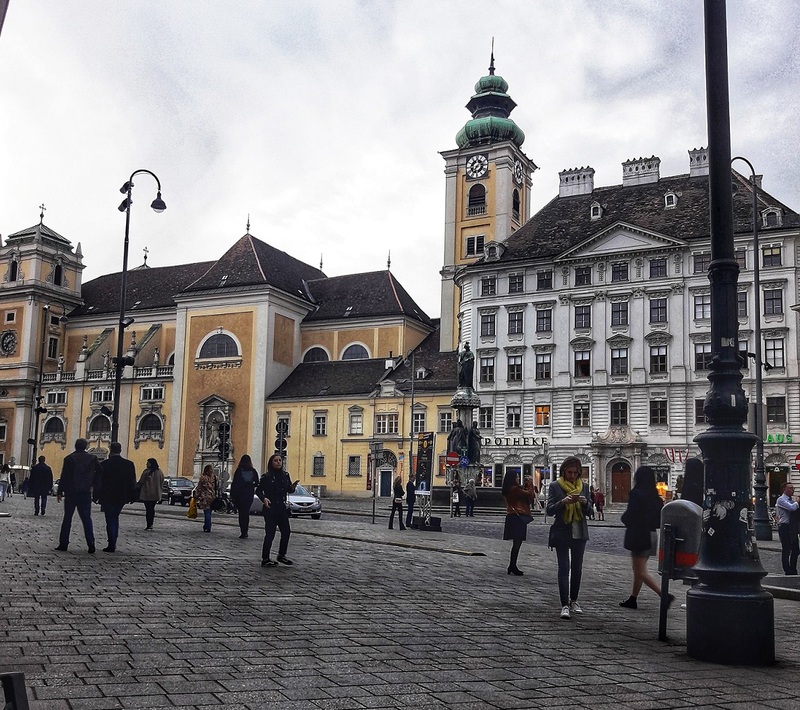 Vienna was designated in 2018 for the ninth consecutive year the city with the highest living standard. At first glance, this is clear, especially in comparison to Chisinau 🙂 but as a tourist, I do not think you feel what this means, I think the locals know better and feel what this position implies in the ranking. In Vienna, there is one of the museums with natural size wax figures. There are only a few in the world. In Europe, there are also in London, Berlin, Blackpool, Amsterdam, and Istanbul. Vienna is an expensive city. More expensive than other European cities, but it is not the most expensive. It is more expensive for tourists because higher prices are where tourist attractions are – you know this 🙂 For example, museum entries are 20-28 euros, still water – 3-5 euro, cappuccino – 3.50 – 5.50 euros. Of course, everything depends on the place, time, but also on other criteria. Transport. The metro is very popular and probably the most used. Of course, taxis and are also a kind of special „bicycle” with a driver – for two people, but also many horse-drawn vehicles, which start at the Hofburg Palace and tour through the center. A trip costs 55 euros. Vienna is the city where you can go by train or boat for several hours to Bratislava, Prague or Budapest. The airport is about 40 minutes from the city center. From the airport to the city you can go by train. The currency used, I think you know: D, it’s the euro. If you have some curiosities that cannot be found here, you can write to me on Facebook or Instagram. There is also a post about the places you are eager to visit when you are in Vienna.